USE THE REGISTRATION SECTION ON THE BOTTOM LEFT OF THIS PAGE to log in. e-mail address where you receive our e-mails. You will receive an e-mail telling you how to reset your password. In order to be enrolled, you must enter your PAYMENT INFORMATION, CHECK OUT, get to the THANK YOU page AND receive an email confirmation. Registration Fee: $50.00 non-refundable per student (due with first tuition payment). Tuition is based on a yearly session from August 20, 2018 - June 2, 2019.
you may pay in 3 quarterly payments, 2 bi-annual payments or 1 yearly payment. Tuition is due on the 1st day of the month. For your convenience, we offer automatic billing on the 1st of the month with MasterCard, Visa and American Express. Payments also accepted by cash or check. If you begin classes after August 20, 2018, you will still be required to follow one of the above payment plans; and pay the annual tuition at a prorated fee. Tuition not paid by the 10th of the month will incur a $15.00 late fee. You will be required to purchase a recital costume for each class that your child takes. A $60.00 deposit (plus tax) is due for each costume on November 1, 2018, with the balance due on March 1, 2019. Recital Fee: $130.00 non-refundable fee per student due on February 1, 2019. 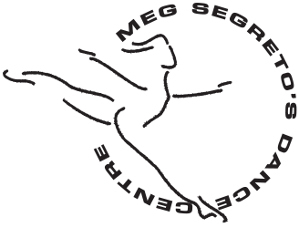 Already Registered with Meg Segreto's Dance Centre? New to Meg Segreto's Dance Centre? If you have taken classes before with Meg Segreto's Dance Centre and you have given us your e-mail address, try the forgot your password link. If not, please contact the office to give us your e-mail address and to set your password.